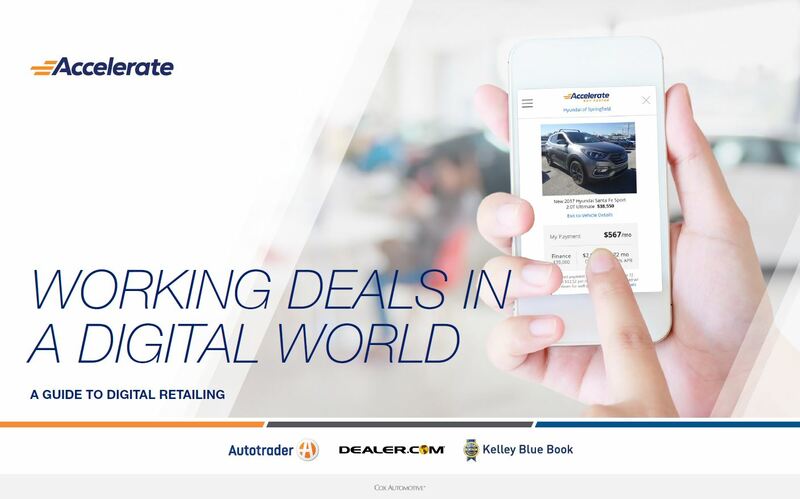 Working Deals in a Digital World - Cox Automotive Inc.
Digital Retailing isn’t simply a product you turn on and instantly start reaping its benefits; getting the most out of it requires a shift in culture, mentality and process. Digital Retailing’s success depends on salespeople ignoring the typical “Come into the store!” behaviors in favor of using digital retailing as an opportunity to build a relationship. If you prioritize loyalty over lead volume, you’ll reap far greater, more sustainable benefits in both the short- and the long-term. Studies show that shoppers who are asked for information about credit scores, budgets and trade-ins are more honest and accurate online than they are in the showroom when they see how their information is connected to payment or price. Dealerships have arrived at a moment of unprecedented opportunity, where it’s now possible to drive increased efficiency, profitability — and even customer loyalty — at the same time. More and more, car shoppers are ready to start — and even make — deals online. Thanks to a convergence of high consumer expectations, rapidly evolving technologies and a greater understanding of online behaviors, the stage has been set for revolutionizing the deal with Digital Retailing — from how long it takes to where it takes place — with the results being mutually beneficial to both the dealer and the shopper. But Digital Retailing isn’t simply a product you turn on and instantly start reaping its benefits; getting the most out of it requires a shift in culture and mentality. Dealers who have found success with Digital Retailing tools understand this, infusing a customer-centric approach to their entire sales process, allowing them to protect margins, improve their workflow and increase customer satisfaction all at once. And by embracing a handful of simple but important ideas, your dealership can, too. When you bring digital retail tools into your sales process, you also need to bring a new mindset to the process. One of the biggest philosophical shifts your entire staff needs to make is in how it views what looks like a massive amount of lead opportunities. Digital Retailing’s success depends on ignoring leads — and the typical “Come into the store!” behaviors that come with them — in favor of using these opportunities to build a relationship. If you prioritize loyalty over lead volume, you’ll reap far greater, more sustainable benefits in both the short- and the long-term. It’s also important to understand that Digital Retailing depends on a holistic approach — viewing every piece of the process as linked and complementary. Digital Retailing enables a seamless experience from your website to your showroom IF you understand and embrace all the potential connections you can create. Finally, the level of transparency and accuracy Digital Retailing technology enables — from the vehicle details page (VDP) all the way to the F&I office — can be daunting. Forget your bias against informed shoppers; Digital Retailing has the potential to turn them into the best customers you’ve ever had. It all comes down to converting a shopper (someone who’s looking for a car, a price, a monthly payment, a good trade-in quote, etc.) into a buyer (simply put, someone who looks at an offer and says “Yes!”) Build momentum in favor of the “Yes” moment online rather than putting all your efforts toward getting the customer into the store. Digital Retailing — like the overall process of marketing and selling a car — is an intricate and often complex process. Keep these five guidelines in mind to ensure you’ve covered the bases that will keep you on the path toward faster, easier and more enjoyable sales. Download the full e-book to learn more about each of these five steps. For more educational resources on Digital Retailing, click here. Check out the eBook to learn more.